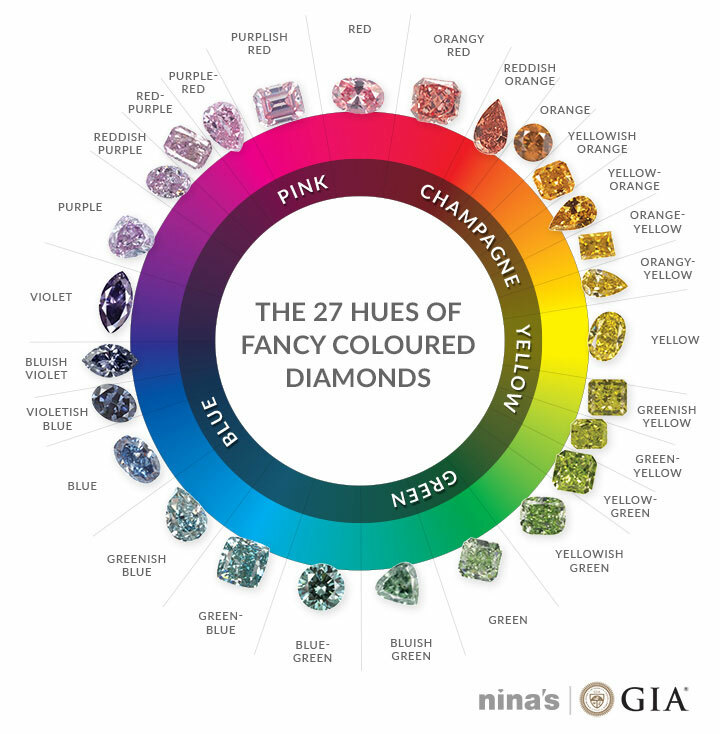 This colour wheel illustrates each of the 27 hues used in the GIA (the Gemological Institute of America) standard to describe fancy coloured diamonds. The diamonds shown here as examples for each hue all have strong saturation levels. Colours reach their strongest saturation at different tones, as you can see, the yellow diamond is lighter than the blue. This colour wheel shows examples of each of the 27 hues used by GIA to describe fancy coloured diamonds. Select a popular colour range below to explore the range of tone and colour intensity found within each hue. Yellow diamonds occur in some of the highest levels of saturation of any coloured diamond. “Cooler” yellows sit toward the yellow/greenish-yellow hue boundary. 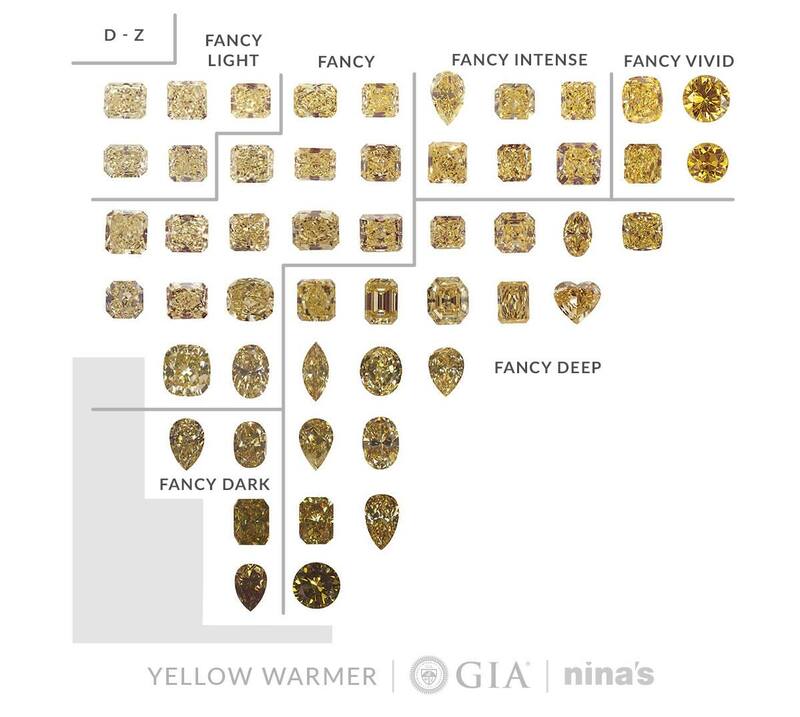 Unlike many of the other colour charts, which start with Faint, Very Light, and/or Light, yellow diamond colour grades begin with Fancy Light. 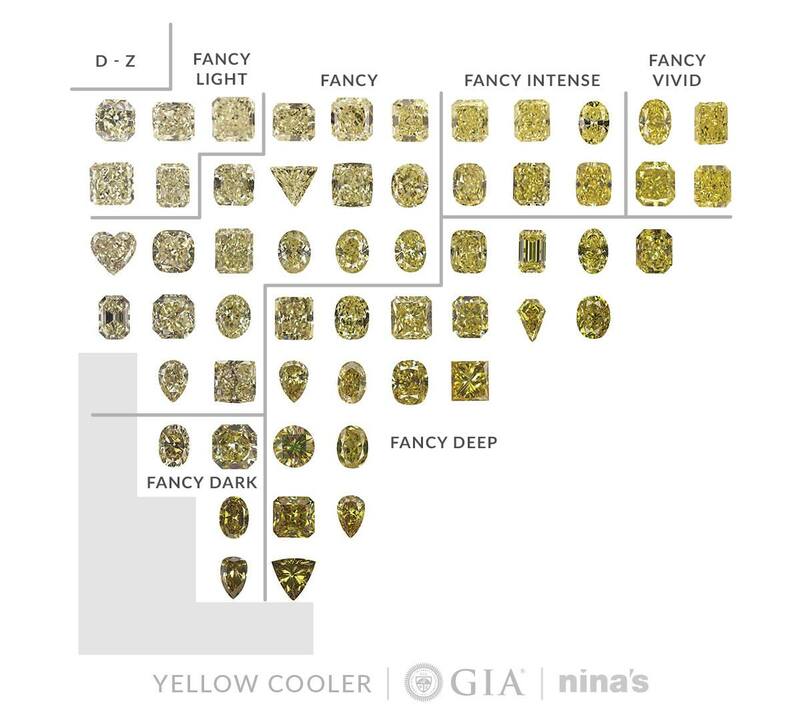 This is because paler yellow diamonds are part of GIA’s D-to-Z colour scale which is used to categorise white diamonds. The shaded areas, where no diamonds are illustrated, indicate areas in the yellow hue range in which diamonds are described as predominantly brown. Yellow diamonds occur in some of the highest levels of saturation of any coloured diamond. “Warmer” yellows toward the yellow/orangy-yellow hue boundary. Orange-yellow diamonds occur in tones and saturations similar to those in the yellow hue. 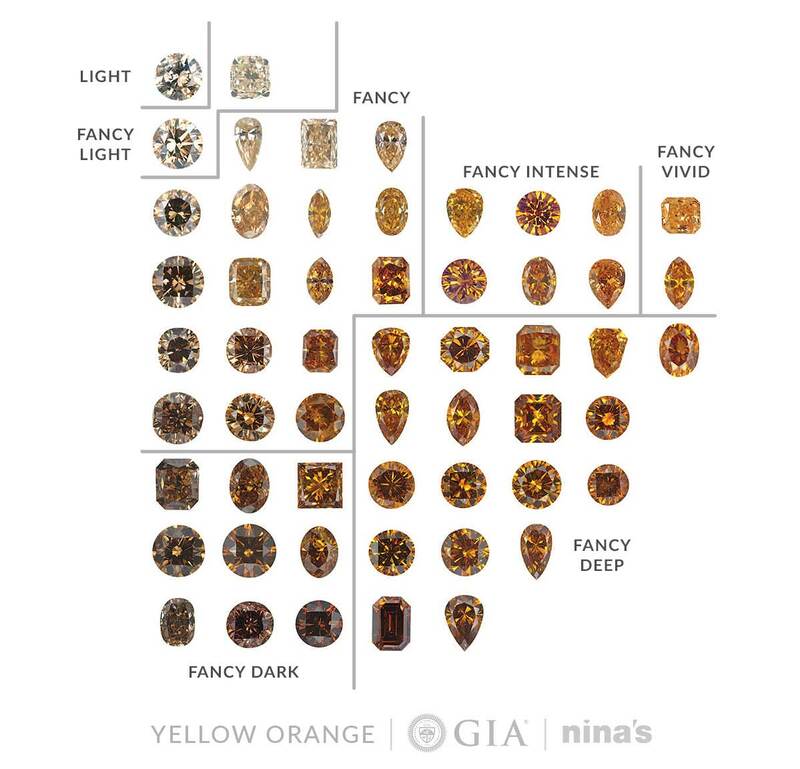 It is in this hue range that most D-to-Z brown diamonds occur. As with yellow diamonds, there are no grades of Faint or Very Light in this hue range. 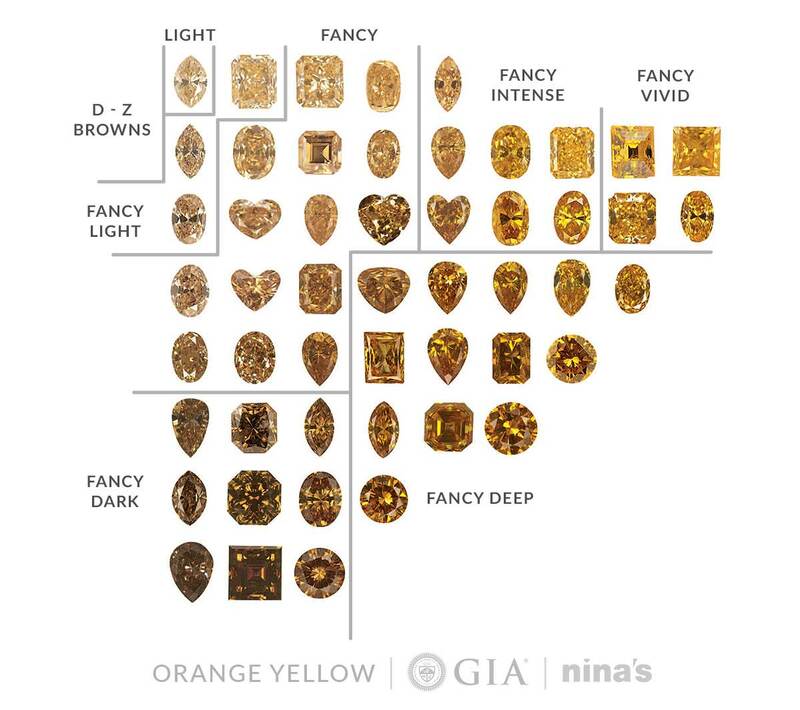 However, unlike the yellow charts, diamonds described as predominantly brown are shown here. Since the use of the term brown (or grey for cooler hues) is associated with colour appearances that are weaker and or darker, the predominantly brown colours are located toward the lower left of the chart. In this hue, the term brown can be modified by yellow or yellowish. Yellow-orange diamonds occur in a wide tone range and reach their strongest saturation at a slightly darker tone than do yellow diamonds. It’s not unusual for diamonds in this hue range to be modified by brown or brownish. Diamonds in the orangy red hue do not typically reach as high a saturation level as those in yellow, orange-yellow, or yellow-orange. For this reason, the grades are slightly more compressed. 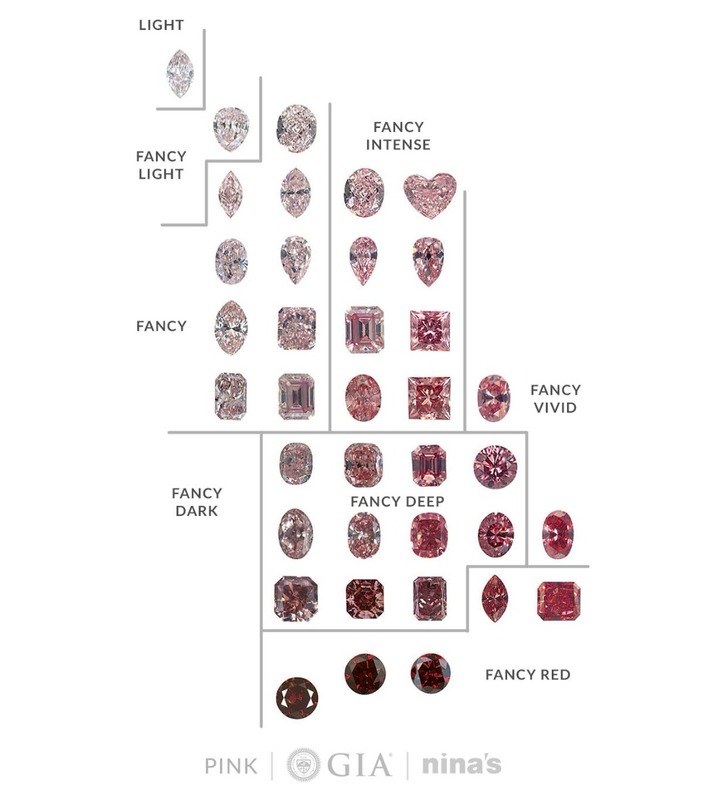 With the exception of the two orangy red diamonds at lower right, the diamonds represented on this chart are described as predominantly pink; that is, their descriptions do not end in the word brown. Diamonds in the red hue occur in tones and saturations similar to those in the orangy red and purplish red hues. 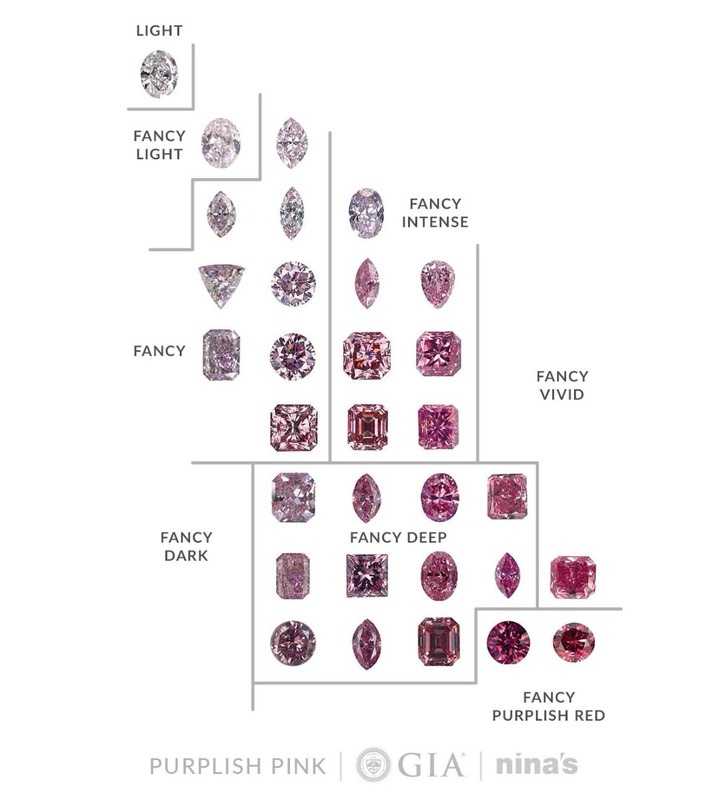 Again, most of the diamonds represented on this chart would be described as predominantly pink. However this chart also includes examples of very dark colours that would be described as red-brown or reddish brown. The dark tones of these colours might be confused with saturation if not compared to known references. 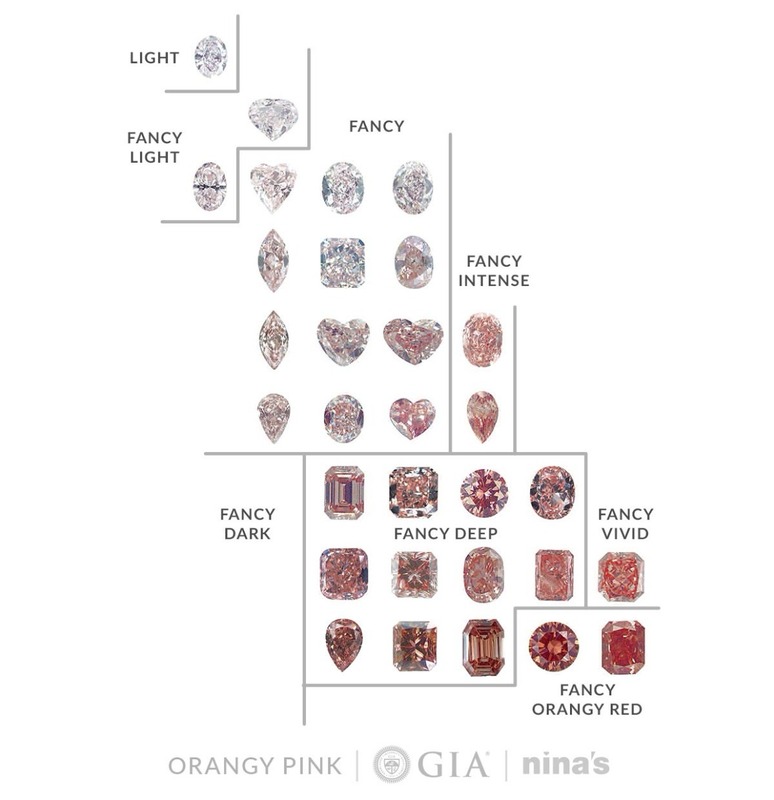 Similar to diamonds in the orangy red and red hues, diamonds in the purplish red (most commonly, purplish pink) hue occur in a wide range of tones and reach their highest saturation at darker tones. Unlike the majority of pink diamonds in the orangy red hue, the colours here are often zoned, which makes cutting choices with regard to face-up colour challenging. Blue diamonds occur in a relatively narrow saturation range, typically toward the neutral core of colour space, but they vary widely in tone. 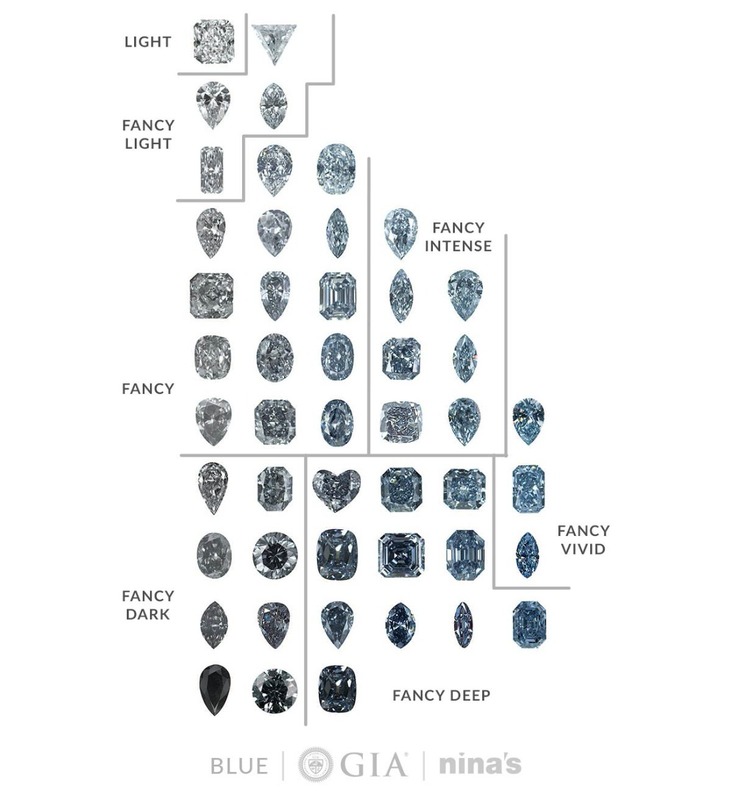 Blue diamonds reach their highest saturation at medium to dark tones, which are toward the lower right of the chart. 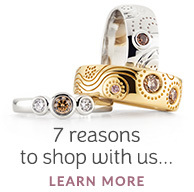 The diamonds in the column on the far left represent an area of little discernible saturation where different appearances are primarily due to tone. Yellow-green diamonds typically occur in slightly lower saturations and slightly darker tones than do yellow diamonds. 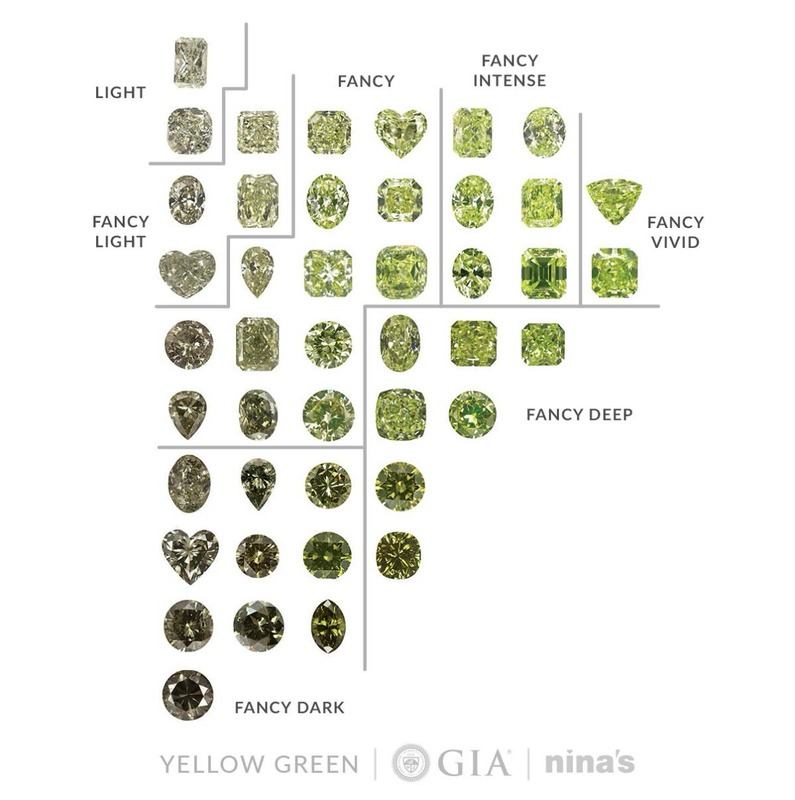 Yellow-green diamonds transition smoothly throughout their hue range. Weaker, darker colours appear predominantly grey. Such colours can be seen at the lower left on the chart.